It is time to wrap up this first series of post on the elections coming for 2010. First, we can feel a certain shift in the air maybe indicating we might be at the edge of significant changes; thus it is a good time to take stock. Second, the end of the year is coming up fast, less time and need to write while I expect significant news to take place as Chavez will not stop the campaign through the holidays; and for once the opposition might not. Thus this updated summary of the preceding texts, including recent developments. I am just going to address a few of the points made before, in no particular order. The date. We have a potential date although this is not officially published. The CNE has proposed a mid to late September vote. The government cannot wait any longer than September. It knows that it cannot dispose of as much income to buy votes as in previous elections and thus has decided to compensate in part this by putting the vote at the end of the school vacation period, when supposedly the anti Chavez middle class votes the least. Not that this would change significantly the results but an increased middle class abstention could give chavismo an extra couple of seats (Caracas? Valencia?). This is the type of calculation chavismo has been forced to do as its situation deteriorates more and more. Also vacation time implies less electricity consumption, less water consumption, less traffic, less reminders of how failed chavismo is at managing the country. There is no accident at how suddenly electricity and water collapsed last October as a national crisis: summer holiday neglect following years of neglect followed by a return to business activity. That is why instead of holding the vote as it should be scheduled, late November or early December, we will vote in mid September. No other election. This series was tagged in plural because I was going to write an additional post covering the elections to the local councils and the essential election for a new mayor of Maracaibo (plus some other overdue). But the CNE seems willing to violate electoral law once again and put off to 2011 the elections for municipal councils, an amazing two years overdue!!!!! The other votes are not decided yet but all seems to point out that they will also be put AFTER the September election. The interpretation is very easy: chavismo has decided that the lone priority they have is to retaining a majority at the National Assembly. Failure to do so will imply opposition financial control , the possibility of inquiry into the dark accounting practices of the regime AND a reverse on some measures of the regime such as its strangle hold over the media. This simply cannot be allowed. If the elections for the Assembly are lost, it really does not matter for chavismo whether it wins councils and Maracaibo: Chavez will be forced into making his final coup or he will be tossed over by some disgruntled faction of the PSUV. The decision seems to have been taken that nothing can distract from the National Assembly campaign, the essential key if Chavez to install a system that will make it impossible for the opposition to challenge him in 2012. Chavismo problems. Over the last couple of months chavismo has been going from bad to worse and for the first time since 2002 Chavez numbers start appearing in some polls below 50%. What is worse the measured index of dissatisfaction of these polls suggests that the slide down of Chavez could keep going on to very dangerous levels. The reason is very simple: chavismo and Chavez have done to themselves what nobody so far was able to do: open a weak flank. This was courtesy of years of neglect, of a deliberate refusal by the incompetence of chavismo to follow the sensible plans laid for the country before he came to power, plans that were simply taking into account the natural growth population to build the necessary infrastructure to provide water and electricity (and other services, by the way, which are more time bombs in waiting). It is very difficult for any government to recover ten lost years in a few months, and much more difficult when a government is led by a bunch of sycophantic corrupt and incompetent officials. Chavismo already on the defensive since the mid of the year has had suddenly to change its electoral strategy. The first try was the “war” with Colombia, trying to exploit cheap nationalism, the well known last refuge of the scoundrels. So far, it seems not to work very well unless we see this as an excuse to purge chavismo before the end of the year and made it more radical for next year campaign. We could see the surprise ousting of the more corrupt leg of the triumvirate now in charge: Diosdado Cabello who seems to be given more and more apparent power so as to make him take the fall for all of Chavez failures. This could be the big end of December move of Chavez. That “war”objectives could also include the ousting of Tachira opposition governor. Opposition growing pains. We seem to be having good news from the opposition leadership. It seems, with still quite a few screeches, that the political leadership has understood that unity is the only way to go, no matter how low chavismo numbers fall, a number that no one in his or her sane judgment should expect to go below 40% before September 2010. As we have seen with 45% chavismo can still take a National Assembly majority against a more or less unified opposition, and trash a divided opposition with as little as 40% of the vote. The problem of course is how to reach the holy unity grail. Small steps seem to be taken. That the date appears to be finally set has brought forward opposition united candidacies and electoral programs due dates Easter 2010. That is, the opposition has 5 months to put its act together, no time to waste with a Chavez in brutal campaign mode already. This is probably part of the explanation of Leopoldo Lopez finally sitting down with the other guys. We do not know exactly why it took so long, but it seems that the points he raised were at least partially valid, shook a little bit the “establishment” and the opposition realized that he was better inside than outside. On the other hand, Lopez starting his own brand new party might have realized that he could not take upon himself the possible blame for division. With AD, PJ, UNT, PODEMOS, COPEI and now Lopez TU, all the big players are talking together. The minor to very minor ones should now realize that a back seat at the table is better than no seat as the mood of the country will not favor the “saboteurs”. Still, let’s not open the champagne bottles, we will only be able to breathe more freely next year if the current trend persists during the Xmas holiday. The nomination process. To conclude this post, this item in three sub categories. The list vote. There are 52 representatives to be elected through a list vote, a vote at large at state level (roughly 33% of seats). These should be nominated by a grand agreement between all political parties. The “safe seats”, about 20-25, those that the opposition is almost sure of winning, should be given to established politicians or public figures that will require to campaign less for their seats and that would be willing and even eager to campaign for all the guys running in more difficult districts. That is, we are talking here of the creation of a super campaign team of at least 20 national or regional figures, a team illustrating the diversity and the unity of the opposition at least to preserve democracy. District votes. The problem is not solved here. The CNE will announce as late as possible the gerrymandering it is preparing. Thus the opposition should decide as soon as possible a nomination process that will ensure a speedy nomination once the CNE speaks. This would be a mix of primaries, political agreements and polls, depending on the area. It has been pointed out to me that the opposition has a major conceptual flaw: it accepts to run under the CNE rule but it will not accept to have the CNE run its primaries. I was also told that primaries run by the CNE would be cheaper than those run by the SUMATE or any other volunteer organization. Why not use the CNE? One thing is certain, CNE or not, gerrymandering or not, by January the opposition must have at least the method on how to chose a candidate. Whichever decisions are reached there should be a significant amount of primaries involved to motivate the electorate. I probably will revisit that issue soon. La tarjeta unica (the single ballot card). This is in my opinion a running canard that looks more like a publicity stunt for some than anything truly serious. In Venezuela elections carry a lot of different ballots, sometimes a dizzying variety, even for a single candidate. There is that theory mostly pushed by Caracas politicians that a single ballot would do wonders to present an image of unity. Usually the less likely the politician is to receive votes, the more s/he defends the single ballot card. The counter argument of course is that not only a candidate can be supported by many parties, but there is a need for political parties to count themselves, something that can happen only at election time. Duh! The solution is actually simple: if the district representatives are going to be picked up through primaries then the general election can be carried through single ballot card. Also, since each state has list representatives, those can be voted through multiple ballot cards and the counting takes place at the state level. This evolving “dogma” needs to be addressed fast as I am afraid that some could use it to sabotage the opposition effort. Conclusion. In spite of all the difficulties existing right now the election is for the opposition to lose. I know that 9 months is a long time but my opinion is that the opposition will win or lose the election by Easter 2010. Any fake economic recovery that chavismo might be able to coax through Venezuelan debt impossible to pay off will take effect as of March or April. If by then the opposition has not been able to articulate a plan and a team, it will be over as enough people will simply swallow the Chavez line once again turning away from of a squabbling alternative. You read it here first, remember. 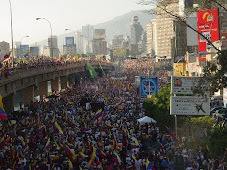 I know I'm a bit late in commenting on this post over two months after you published it, but I have linked it, along with a couple of others in your "2010 elections" category, from a blog entry I posted today on the phenomenon of Electoral Abstentionism in Venezuela. I use a translation of an editorial written by Ibsen Martinez for Colombia's El Espectador newspaper, which was published yesterday; Sunday, January 31. You have really done most excellent work here.